It's like a fanboy's development dream team: EA, 38 Studios, Todd McFarlane, and R.A. Salvatore are joining forces to make a new RPG. It's been a while since EA amazed us with a new RPG — aside from anything BioWare's put out recently — but the publisher seems to be making up for lost time, since it announced today that it's working with 38 Studios on a brand new title. The game, Kingdoms of Amalur: Reckoning is going to be the end result of a collaboration between 38 Studios, Todd McFarlane (co-founder of Image Comics and the man behind Spawn), and fantasy novelist R.A. Salvatore. At the moment, the game sounds like standard fantasy fare, according to EA's description. "Reckoning is a single-player RPG that sets players on a heroic journey to unlock the mysteries of Amalur. Amalur is a magical world, filled with strange landscapes, exotic cities, colorful characters and terrifying creatures." According to Ken Rolston, the man directing the game's development, the game is going to be a combination of classic RPG elements and a new type of combat. "We built the open-world exploration, vast narrative and character customization fans expect from the best RPGs. And we've added something new that we've always wanted from the genre — a fast-paced, graphically stimulating action combat experience with fluid control and immersive, discoverable gameplay fans haven't seen before in other fantasy RPGs." While Todd McFarlane is a talented artist, the man's track record with video games is pretty spotty (the best Spawn game was mediocre at best, and McFarlane's Evil Prophecy was pretty horrid). Salvatore's writing has made him immensely popular with fantasy fans, largely thanks to the man's creation of Drizz Do'Urden. Salvatore also wrote the Demon Stone videogame in 2004, which was met with mixed-to-positive reviews. Rolston, meanwhile, was the lead designer of The Elder Scrolls III: Morrowind and The Elder Scrolls IV: Oblivion. This Thursday, Comic-Con attendees will have the opportunity to learn about the game from McFarlane, Rolston, Salvatore and 38 Studios Chairman Curt Schilling. Aside from a panel discussion about Reckoning, the group will unveil the game's debut trailer, which was directed by McFarlane. Those interested in the game will probably want to check out its official website. For the moment, the site only has a title and placeholder artwork, but it will likely be updated after the info session on Thursday. 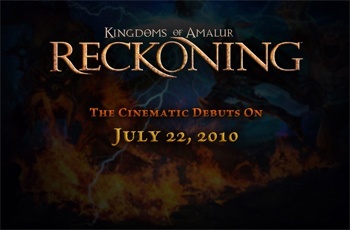 Kingdoms of Amalur: Reckoning is due to be released in Fall 2011 for PC, PS3, and 360.